See Help:Editing for information on editing Wikipedia. To experiment with editing, please use the sandbox. "Editor" redirects here. For other uses, see Editor (disambiguation). The editing process often begins with the author's idea for the work itself, continuing as a collaboration between the author and the editor as the work is created. Editing can involve creative skills, human relations and a precise set of methods. Copy editors correct spelling, grammar and align writings to house style. Changes to the publishing industry since the 1980s have resulted in nearly all copy editing of book manuscripts being outsourced to freelance copy editors. 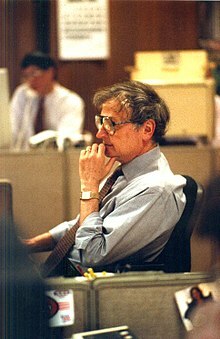 Page 1 Editor Jack Breibart in the San Francisco Chronicle newsroom, 1994. Copy editor or manuscript editor, who prepares the copy for conversion into printed form. In the case of multi-author edited volumes, before the manuscript is delivered to the publisher it has undergone substantive and linguistic editing by the volume's editor, who works independently of the publisher. As for scholarly journals, where spontaneous submissions are more common than commissioned works, the position of journal editor or editor-in-chief replaces the acquisitions editor of the book publishing environment, while the roles of production editor and copy editor remain. 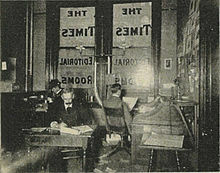 However, another editor is sometimes involved in the creation of scholarly research articles. Called the authors' editor, this editor works with authors to get a manuscript fit for purpose before it is submitted to a scholarly journal for publication. The primary difference between copy editing scholarly books and journals and other sorts of copy editing lies in applying the standards of the publisher to the copy. Most scholarly publishers have a preferred style that usually specifies a particular dictionary and style manual—for example, the Chicago Manual of Style, the MLA Style Manual or the APA Publication Manual in the US, or the New Hart's Rules in the U.K.
Technical editing involves reviewing text written on a technical topic, identifying usage errors and ensuring adherence to a style guide. Technical editing may include the correction of grammatical mistakes, misspellings, mistyping, incorrect punctuation, inconsistencies in usage, poorly structured sentences, wrong scientific terms, wrong units and dimensions, inconsistency in significant figures, technical ambivalence, technical disambiguation, statements conflicting with general scientific knowledge, correction of synopsis, content, index, headings and subheadings, correcting data and chart presentation in a research paper or report, and correcting errors in citations. Large companies dedicate experienced writers to the technical editing function. Organizations that cannot afford dedicated editors typically have experienced writers peer-edit text produced by less experienced colleagues. It helps if the technical editor is familiar with the subject being edited. The "technical" knowledge that an editor gains over time while working on a particular product or technology does give the editor an edge over another who has just started editing content related to that product or technology. But essential general skills are attention to detail, the ability to sustain focus while working through lengthy pieces of text on complex topics, tact in dealing with writers, and excellent communication skills. "Paid editing" redirects here. For paid editing on Wikipedia, see Paid editing on Wikipedia. Editing is a growing field of work in the service industry. Paid editing services may be provided by specialized editing firms or by self-employed (freelance) editors. Editing firms may employ a team of in-house editors, rely on a network of individual contractors or both. Such firms are able to handle editing in a wide range of topics and genres, depending on the skills of individual editors. The services provided by these editors may be varied and can include proofreading, copy editing, online editing, developmental editing, editing for search engine optimization (SEO), etc. Self-employed editors work directly for clients (e.g., authors, publishers) or offer their services through editing firms, or both. They may specialize in a type of editing (e.g., copy editing) and in a particular subject area. Those who work directly for authors and develop professional relationships with them are called authors' editors. ^ Mamishev, Alexander, Williams, Sean, Technical Writing for Teams: The STREAM Tools Handbook, Institute of Electrical and Electronics Engineers, John Wiley & Sons. Inc., Hoboken, 2009, p. 128. ^ "Encarta Dictionary definition of "editing"". Archived from the original on 31 October 2009. ^ "Encarta Dictionary definition of "editor"". Archived from the original on 31 October 2009. ^ a b Poland, Louise, The business, Craft and Profession of the Book Editor, in Carter, David, Galligan, Anne, (eds. ), Making books: contemporary Australian publishing, Queensland University Press, 2007, p. 100. ^ Appiah, Bernard (2009). "Science editing at an Indian firm: perspectives of two US visitors" (PDF). Science Editing. 32 (4): 118–119. Archived from the original (PDF) on 2013-09-28. Morrison, Blake (6 August 2005). "Black day for the blue pencil". The Guardian. Overholser, Geneva (December 1998). "Editor Inc". American Journalism Review. Stephen, Leslie (1898). "The Evolution of Editors". Studies of a Biographer. 1. London: Duckworth and Co. pp. 37–73. Ó Brógáin, Séamas (2015). A Dictionary of Editing. 1. Dublin: Claritas.